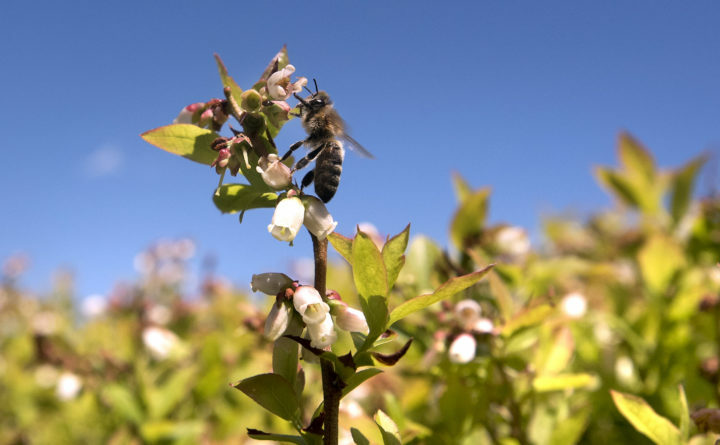 A bee is seen on a blueberry plant in a Deblois in this 2017 photo. Having honey bees present increases the yield of berries by 1000 pounds per hive per acre. We are just entering, by far, the busiest time of year for beekeepers. This is especially true for me as I prepare for the arrival of hundreds of packages of bees for my customers — more than 4 million bees. Package bees are the earliest way we, up here in Maine, can get new hives started. Packages usually originate in states like South Carolina and Georgia where warm weather means colonies can build up their populations months ahead of Maine. Bees are shaken from strong hives into screened boxes, three pounds at a time. That’s about 13,000 bees. Several packages will be shaken from each hive. Each package is equipped with a can of sugar syrup that will keep the bees inside fed for roughly a week to 10 days. Each package is also given a new queen bee contained in a small screen cage of her own in order to keep her safe while she and her new subjects get acquainted. It takes a number of days of bees feeding the queen, and in the process, picking up and sharing chemical messages called pheromones, for the worker bees in the cage to accept the queen bee as their new mother. During this “getting to know you” phase, the packages are transported all over the country. Each year thousands of packages of bees are shipped to Maine to start new colonies and replace colonies lost during the winter months. When the beekeeper introduces his new bees into his hive he “unlocks” the door of the queen cage. The cage is actually a cleaver time-release mechanism to give the queen a couple more days of safety in her private cage before she is released into the cluster of bees. The “door” is “unlocked” by removing a cork from the portal separating queen from bees. Behind this cork however is about an inch of fudge-like candy which still blocks the passageway. It takes the bees two to three days to eat their way through the candy to open the “door”. By that time, the queen and cluster of bees have shared pheromones for long enough that the new queen is accepted. Over the coming weeks the hive will grow. The worker bees will build wax honey comb, a fine latticework of hexagonal cells. The newly released queen bee will lay an egg in each cell, thousands per day, which in three weeks will emerge as adult bees. As new bees hatch the colony will grow quickly, visiting millions of flowers per day. Tending the bees in a happy healthy hive in the spring is one of life’s great joys for the beekeeper. Many new beekeepers start hives each year. I’ve been travelling all over the region from Presque Isle to Sullivan to Readfield teaching beginner classes to give prospective beekeepers an idea what to expect and how to look after their bees. Taking a class is the best way to improve the chance that your bees will survive the coming winter. I have a few more one-day beginner and intermediate classes coming up in Hampden on Sunday, May 20, and Saturdays on June 2 and June 16. This is also the time of year where I prepare hives to head out to the blueberries for pollination. Maine requires tens of thousands of hives each spring to pollinate this crop. Having honey bees present increases the yield of berries by 1000 pounds per hive per acre. As we progress into May hives grow very quickly, and in some cases, they get strong enough to split into two, or swarm. While the arrival of a swarm of bees can be frightening to those unfamiliar with bee behavior, swarming bees very rarely sting. That’s because they’re preoccupied with the process of moving house. Usually a swarm on the wing can be heard from a couple of hundred yards away. Very soon they will settle on a tree limb or some other perch and cluster together around their queen like a living basketball of bees. There they will stay for a couple of hours or perhaps days while they send out scouts to find a nice hollow in a tree or house soffit where they can build their new hive. If you should see a swarm, give me, or another beekeeper a call as soon as possible. We can then come out and capture the bees before they move on to their permanent home. The swarm can then be placed into a new hive that the beekeeper can care for and protect from mites. Bees which have moved into wild will usually die from mites within a year.